Monarchs and their heirs are not always noted for their rational medical advice. But James VI of Scotland, who became James I of England in 1603, was different. Published anonymously in 1604 but immediately credited to the king, A Counterblaste to Tobacco flew in the face of prevailing medical opinion by outlining some of the chief health risks of smoking more than three centuries before scientists made the connection. Possibly the first official antismoking campaign, the royal pamphlet highlighted cost and passive smoking as two of the most powerful arguments against tobacco, while it lamented that addiction, peer pressure, and fashion were among the most difficult obstacles to overcome. A Counterblaste to Tobacco is written in Early Modern English and refers to medical theories of the time (e.g. the four humours). In it, King James I blames Native Americans for bringing tobacco in Europe, complains about passive smoking, warns of dangers to the lungs, and decries tobacco's odour as "hatefull to the nose." James's dislike of tobacco led him to authorize an excise tax and tariff of six shillings and eight pence per pound of tobacco imported, or £1 per three pounds, a large sum of money for the time. Royal insights on smoking - Moore 340: c1408 - BMJ. 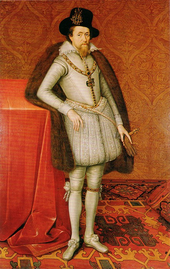 Image source: James I, VI by John de Critz, c.1606, Wikipedia, public domain. A Counterblaste to Tobacco. Wikipedia. @CardioNP: 400+ yrs later I still wade thru smoke to enter the hospital.